Researchers in the CTL undertake analyses of physical, mineralogical, and elemental properties of pottery to provide precise data relating to chronology, provenance or manufacturing origins, processes of production, culture change, and the development of sociopolitical and economic complexity. Research focuses geographically on Florida, the Southeastern US, and the Caribbean Basin. 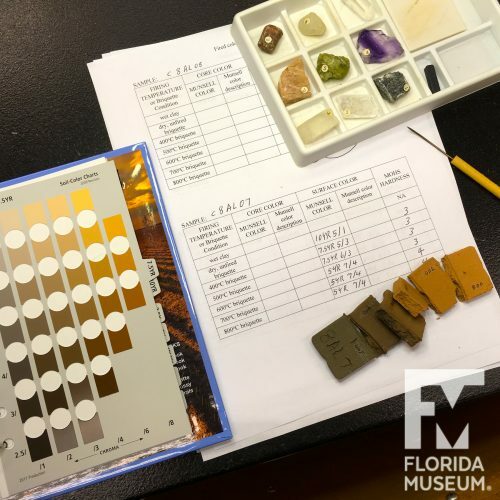 In the CTL, we apply a wide range of analytical techniques, including sherd refiring, vessel reconstruction, formal and functional analysis, and various experiments with clays, with emphases on petrographic analysis and elemental analysis. Characterizing the mineral and elemental composition of pottery provides data used to address questions of pottery technology and manufacturing origins (i.e., provenance), which ultimately contribute to our understandings of past manufacturing techniques, social interaction, mobility, and exchange. The determination of provenance among earthenware vessels, in particular, often involves comparisons with clay samples collected from the vicinity or region of archaeological interest. 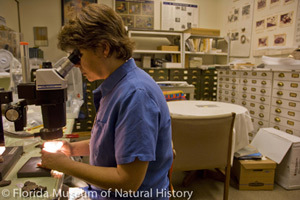 Petrographic analysis is a geological method that has been applied to archaeological pottery since the 1930s. Petrographic characterization of pottery thin sections provides identification of constituent mineral grains and quantification of constituent particle size and abundance. To obtain elemental data on ceramics and their component parts, researchers in the CTL use a variety of analytical techniques including laser ablation-inductively coupled plasma-mass spectrometry (LA-ICP-MS), neutron activation analysis (NAA), and X-ray fluorescence spectrometry (XRF). 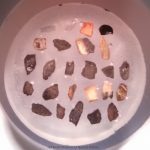 2017 Point/Counter Point II: the Accuracy and Feasibility of Digital Image Techniques in the Analysis of Pottery Tempers using Sherd Edges. In Integrative Approaches in Ceramic Petrography, edited by Mary F. Ownby, Isabelle C. Druc, and Maria A. Masucci, pp. 196-214. University of Utah Press, Salt Lake City. 2017 Provenance of Weeden Island “Sacred” and “Prestige” Vessels: Implications for Specialized Ritual Craft Production. Southeastern Archaeology 36(2):131-143. 2015 Was St. Johns Pottery Made with Swamp Muck As Temper? An Experimental Assessment. The Florida Anthropologist 68(3-4): 97-112. 2013 Paste Variability and Clay Resource Utilization at the Fountain of Youth Site, St. Augustine, Florida, 8SJ31. In Life Among the Tides: Recent Archaeology on the Georgia Bight, edited by V.D. Thompson and D.H. Thomas, pp. 95-117. Anthropological Papers of the American Museum of Natural History, no. 98. 2013 Petrographic Analysis of Pottery and Clay Samples from the Georgia Bight: Evidence of Regional Social Interactions. In Life Among the Tides: Recent Archaeology on the Georgia Bight, edited by V.D. Thompson and D.H. Thomas, pp. 119-142. Anthropological Papers of the American Museum of Natural History, no. 98. 2011 The Swift Creek Gift: Vessel Exchange on the Atlantic Coast. University of Alabama Press, Tuscaloosa.